The Emory Wind Ensemble (left) joined the Atlanta Youth Wind Symphony to record "In the World of Spirits." Emory Photo/Video. The Emory University Department of Music announces the first album of wind ensemble music recorded by Emory Symphonic Winds. "In the World of Spirits" features a selection of classical Christmas music for wind band on the Naxos Wind Band Classics label. The album is now available online at iTunes, Spotify, Amazon.com and the Naxos Listening Library; CDs are in stores Oct. 24. Included are compositions by Gustav Holst, Claude T. Smith and Phillip Sparke with the epic "Russian Christmas Music" by Alfred Reed as the centerpiece and Leroy Anderson's jaunty "Sleigh Ride," adding some fun to the final track. The effort involved about 100 Emory students and alumni. "This is the equivalent of a book being published," says Scott Stewart, director of wind studies at Emory. 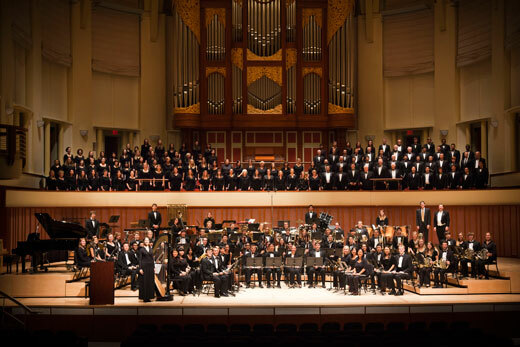 The recordings were made during summer sessions when current and alumni members of the Emory Wind Ensemble and Atlanta Youth Wind Symphony gather as the recording group Emory Symphonic Winds to record three or four pieces composed for wind band. "When Naxos approached us about recording a Christmas-based album," says Stewart, "I was immediately excited about the possibilities of including some of the classics of the wind band repertoire that are not heard as much, plus some 'spirited' pieces which were commissioned by Emory." 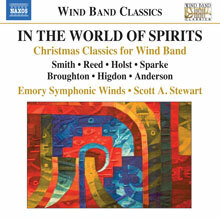 The title track "In the World of Spirits" written by film and television composer Bruce Broughton (of "Silverado" and "Tiny Toons" fame) and "Mysterium" by Pulitzer Prize-winning composer Jennifer Higdon were commissioned by the Emory Wind Ensemble with funding from the University Research Fund and Center for Creativity in the Arts. Of his composition, Broughton says, "Dr. Stewart and the Emory Winds give the piece an energetically enthusiastic performance for this premiere recording." Stewart programs and conducts the music and Kay Fairchild, artist affiliate faculty in brass, serves as recording producer. "Recording this CD has been an incredible experience," says Derrick Montgomery, a senior in the Department of Music. "I am so proud of all the work put into making this project a success and am even prouder of the results."